Recently, considerable interest in the rocks of Mesozoic age in western and northwestern Kansas has been aroused by the possibility of finding commercial quantities of oil and gas in them (Merriam, 1958d). Several publications of the State Geological Survey of Kansas have called attention to possible economically exploitable minerals, both fuel and nonfuel, in rocks of Cretaceous age. At present this mineral wealth, except for clay, is not being developed extensively. In addition to the clay, cropping out in Dakota areas (Plummer and, Romary, 1947; Plummer and others, 1954), materials that merit attention include lignitic coal in the Dakota (Schoewe, 1952); oil shale of poor quality in the Dakota and Pierre Formations (Runnels and others, 1952); glass sand in the Cheyenne Formation (Nixon and others, 1950; Rose, 1950); bentonite (Kinney, 1942); vanadium in clays (A. C. Reed, 1950); cemented sandstone for concrete aggregate, riprap, building stone, etc., in the Kiowa and Dakota Formations (Swineford, 1947); and chalk in the Fort Hays Member of the Niobrara Formation (Runnels and Dubins, 1949). Rocks of Mesozoic age in Kansas are recognized as belonging to the Triassic, Jurassic, and Cretaceous Systems. Their relation to each other and to adjoining units is shown in Figures 12, 13, and 14. Triassic rocks are confined to the extreme southwest, in Morton, Stanton, and Hamilton Counties. Redbeds 40 feet thick, exposed in a small outcrop in Morton County, have been correlated (Moore and others, 1951a) with the Dockum? Group of Triassic age, which crops out in parts of Texas and Oklahoma. Jurassic rocks assigned to the Morrison Formation are distributed in the northwestern one-fifth of Kansas west of a line drawn from Smith County to Morton County, and are restricted to the subsurface. Cretaceous strata cover roughly the western one-half of Kansas arid include both Comanchean (Lower Cretaceous), chiefly exposed in Clark, Comanche, and Barber Counties, and Gulfian (Upper Cretaceous). Figure 12--Cross section from Cheyenne County to Washington County showing correlation and stratigraphic relation of Mesozoic rocks (from Merriam, 1957b). Both a larger version and a very large verison of this figure are available. Figure 13--Cross section from Cheyenne County to Kiowa County showing correlation and stratigraphic relation of Mesozoic rocks (from Merriam, 1957b). Both a larger version and a very large verison of this figure are available. Figure 14--Cross section from Cheyenne County to Morton County showing correlation and stratigraphic relation of Mesozoic rocks (from Merriam, 1957b). Both a larger version and a very large verison of this figure are available. Mesozoic rocks unconformably overlie older Paleozoic rocks and, for the most part, mask the structure of older beds. At different places Triassic, Jurassic, or Cretaceous formations overlie Permian strata. Locally, a conglomerate is developed at the base of the Cretaceous rocks. Over much of the area, rocks of Mesozoic age are in turn unconformably overlain by the Ogallala Formation of Pliocene (Tertiary) age or by Pleistocene deposits. Best exposures of Mesozoic rocks are along the valleys of major streams in western Kansas. Mesozoic rocks in Kansas are mostly marine deposits consisting of shale, sandstone, limestone, and chalk; but they include also considerable amounts of nonmarine sandstone and clay, and minor amounts of lignitic coal, bentonite, chert, and anhydrite. Several thin beds are important stratigraphic markers. Both megafossils and microfossils are abundant in the marine beds. Many studies of Mesozoic rocks in Kansas have been published, but they deal mainly with surface exposures and stratigraphic relations of beds seen at the outcrops. 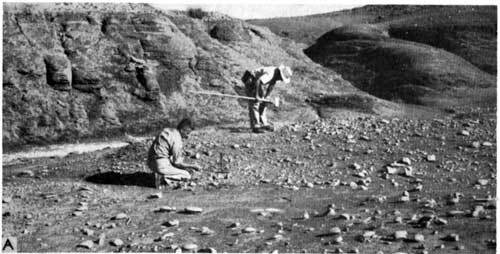 Some of the more important early works include reports by Prosser (1897), Logan (1897), Williston (1897), and Adams (1898), which are mainly stratigraphical; papers by Williston (1898) and Logan (1898) are mainly paleontological. 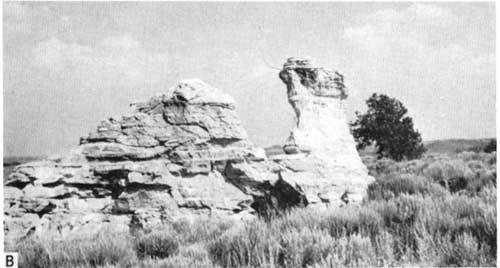 In 1920 Darton published a report on the geology of the Syracuse and Lakin Quadrangles, and in 1924 Twenhofel described the geology and invertebrate paleontology of Comanchean and "Dakota" Formations in Kansas. Then, in succeeding years, papers dealing with the geology of different western Kansas counties were published by Rubey and Bass (1925), Bass (1926), Wing (1930), Landes (1930), Elias (1931), Moss (1932), Elias (1937b), and Landes and Keroher (1938, 1939). In the early 1940s the State Geological Survey of Kansas began issuing a series of reports on the geology and ground-water resources of Kansas counties. These reports, which deal with about 40 central and western counties, have added much to the knowledge of surface geology in this region. Although a great amount of detailed work on stratigraphy of Mesozoic beds has been published, only a few of the studies are mentioned here. Elias (1931) differentiated members within the Pierre Shale by detailed stratigraphic work; Loetterle (1937) published a mainly micropaleontological paper, and Miller (1958) a stratigraphic study of the Niobrara Formation. Hattin (1962) was able to zone the Carlile Shale; Bergman (1950) traced the Greenhorn Limestone across Kansas. Preliminary work on the Dakota in Nebraska and adjoining states was published by Tester (1929). 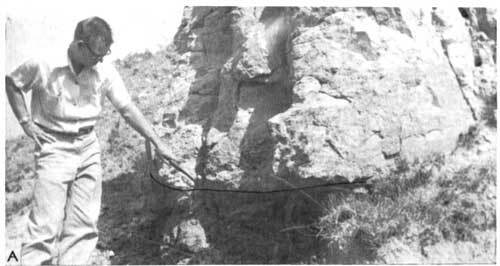 Plummer and Romary (1942) described the stratigraphy of pre-Greenhorn beds in Kansas and followed this with a detailed study (1947) of the Dakota Formation; Merriam and others (1959) described a Dakota core from Cheyenne County. Loeblich and Tappan (1950) made a micropaleontological study of the Kiowa Shale; Latta (1946) published on the Kiowa Shale and Cheyenne Sandstone of south-central Kansas; Swineford and Williams (1945) described the Cheyenne Sandstone in central Kansas. Merriam (1955a) wrote a report on the Morrison Formation (Jurassic). McLaughlin (1942) described the Dockum? 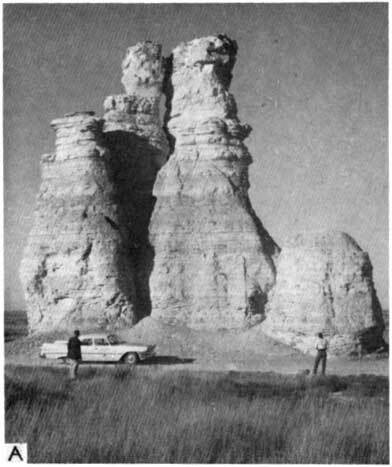 Group (Triassic) in Morton County, and Merriam (1963) described briefly the Triassic rocks in Kansas. Lee (1953) showed correlation of Mesozoic beds along the line of cross section from Meade County to Smith County. The geologic structure of western Kansas and its development during Mesozoic time are discussed in papers by Darton (1905, 1918), Bass (1926), Lee and Merriam (1954a), Merriam and Atkinson (1955), and Merriam (1955b). 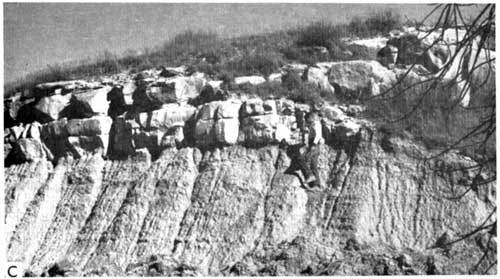 General information on Mesozoic rocks in Kansas can be obtained from Moore and Landes (1937), Moore, Frye, and Jewett (1944), Jewett (1951), Moore and others (1951a), and Merriam (1957b). The Cretaceous System is divided into the Comanchean (Lower) and Gulfian (Upper) Series. In each series are recognized groups, formations, and members. The dividing line between the two series is placed at base of the Omadi Formation and top of the Kiowa Shale (Cobban and Reeside, 1952). Distribution of Cretaceous rocks in Kansas is shown in Figure 15. Figure 15--Map of Kansas showing surface and subsurface distribution of Cretaceous rocks. A larger version of this figure is available. Total thickness of Cretaceous rocks in Cheyenne County, in the northwest corner of the state, is 3,000 feet. The sequence thins eastward, southeastward, and southward to a featheredge, mainly as a result of truncation by post-Cretaceous erosion of the upper part, but also to some extent by overstep of the lower units onto pre-Cretaceous rocks. The overall shape is wedgelike (Fig. 16). Figure 16--Map of Kansas showing thickness of Cretaceous deposits, a wedge-shaped mass of material between Permian, Triassic, or Jurassic units beneath and Tertiary beds above. Contour interval 500 feet. A larger version of this figure is available. Because of absence of traceable beds and paucity of fossils in some Cretaceous units, correlation from the surface into the subsurface is extremely difficult, especially for beds between the Kiowa Shale and Graneros Shale, but tentative correlations have been made. It has been necessary to adopt an unofficial terminology for some units in the subsurface until positive correlations can be made. Figure 17 shows present Kansas Survey classification of Mesozoic rocks and their correlation, or tentative correlation, with subsurface units and terminology. The most obvious departure from Kansas Survey usage is in use of the term "Dakota," which is used as a formational term at the surface but is tentatively used as a group name for Cheyenne Sandstone, Kiowa Shale, and Omadi Formation in the subsurface. Another minor difference is that the Codell Sandstone is treated as a member in the Carlile Shale (see Hattin, 1962) rather than as a zone in the Carlile, as in past usage. Figure 17--Chart showing nomenclature of Mesozoic rocks as proposed by Moore and others (1951a) and equivalent terminology used in subsurface (adapted from Merriam, 1957b). Only one formation of the Montana Group, the Pierre Shale, is present in Kansas. It is the oldest part of the group, which is more extensively developed farther to the north and west. The Pierre Shale is the uppermost Cretaceous formation found in Kansas. The term Pierre was first used by Meek and Hayden in 1862 for rock exposures at old Fort Pierre, in Stanley or Hughes County, South Dakota. In Kansas the unit was first recognized by S. W. Williston (1897) in 1891, whose correlation of these beds in Kansas was based mainly on comparison of vertebrate fossils. It was not until the publication by Elias (1931) appeared, however, that any notable contribution was made in the description and classification of the Pierre Shale in Kansas. In this report Elias first named and described members of the formation as now recognized. Distribution--In Kansas the formation occurs only in the northwestern corner of the state. The best outcrops are those along Smoky Hill and Republican Rivers and in Rawlins County along Beaver Creek. Most of the area of the Pierre is covered by the younger Ogallala Formation. Several outliers both on the surface and in the subsurface are present east of the eastern margin of the formation. These are located in Phillips, Norton (Frye and Leonard, 1949), Graham, Gove, and Logan Counties. Remnants in Gove and Logan Counties are preserved in down-faulted blocks (Moore and Landes, 1937). The outliers in Graham and Norton Counties are apparently preserved in down-faulted areas also. The Pierre Shale, no doubt, once covered a more extensive area than at present. Character--Elias (1931) divided the Pierre Shale into six members (in descending order): Beecher Island Shale, an unnamed member, Salt Grass Shale, Lake Creek Shale, Weskan Shale, and Sharon Springs Shale. In Wallace County only the lower four members and lowermost part of the unnamed member are present. The uppermost member, the Beecher Island Shale, is exposed farther west in Colorado. The Pierre is predominantly shale, which is light to dark gray, soft, slightly calcareous, micaceous, fissile, and fossiliferous (Pl. 3A). The Sharon Springs Member, identified in many logs, is dark-gray to black, micaceous, clayey shale. The formation as a whole contains numerous concretionary zones, but they are difficult to recognize in the subsurface. Thin streaks of bentonite are common. Inoceramus and Baculites fragments are numerous. Plate 3A--Dark-gray, fissile, concretionary Pierre Shale exposed at McAllaster Buttes, Logan County (sec. 13, T. 12 S., R. 37 W.). Thickness--The thickness of the Pierre in Kansas ranges from a featheredge at the southeast limit to 1,600 feet in the extreme northwestern corner of Cheyenne County (Fig. 18). Figure 18--Map showing thickness of Pierre Shale in northwestern Kansas. Several small outliers of Pierre Sale, probably occurring in grabens, are east of east limit of formation. Contour interval 100 feet. A larger version of this figure is available. Stratigraphic Relations--Where it is overlain by the Ogallala Formation, the upper contact of the Pierre Shale is unconformable, but farther west, in Colorado, the Pierre was not truncated, and Fox Hills Sandstone overlies the shale with conformable and gradational contact. The lower contact, with the Niobrara Formation, where observable, seems to be conformable and in places gradational, indicating continuity of the marine sedimentation from Niobrara to Pierre time. In the type area, where the Pierre lies conformably on the Niobrara, the contact is sharp, although some chalk is interbedded between shale beds at the contact through a thickness of a few inches to a few feet (Searight, 1937,p.3). The Colorado Group in Kansas consists of four formations (in descending order): Niobrara Formation, Carlile Shale, Greenhorn Limestone, and Graneros Shale. Outcrops of the group in Kansas are only a portion of the total outcrop area, which extends through parts of Montana, Wyoming, South Dakota, Nebraska, Colorado, and New Mexico. The group is world famous for its chalk beds. The Niobrara Formation was named by Meek and Hayden in 1862 from exposures along Missouri River near the mouth of Niobrara River in Knox County, Nebraska. 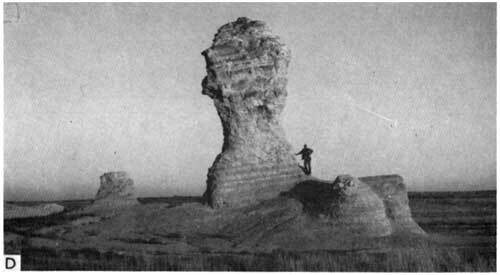 In Kansas, rocks belonging to the Niobrara have long attracted attention because they form some of the more spectacular landscape features of western Kansas, such as Castle Rock (Pl. 4A), Cobra Rock (Pl. 4B), Monument Rocks (Pl. 4C), and the Sphynx (Pl. 4D), in Gove County. These are erosional remnants that tower as much as 70 feet above the surrounding, monotonously flat plain. The early interest in these features, and the consequent availability of photographs taken over a period of 50 years, made it possible for Smith (1944) to investigate modifications of these landmarks. Plate 4--Sculptured forms of Niobrara chalk, Gove County. A, Castle Rock (SW sec. 1, T. 14 S., R. 26 W.). Plate 4B, Cobra Rock (sec. 12, T. 14 S., R. 26 W.). Plate 4c, Monument Rocks (sec. 33 and 34, T. 14 S., R. 31 W.). Plate 4d, The Sphynx (NE sec. 33, T. 14 S., R. 31 W.). Distribution--The belt of outcrop of the chalk beds in Kansas extends from Jewell, Smith, and Phillips Counties to Kearny and Hamilton Counties; the formation is restricted to approximately the northwestern one-fifth of the state. The eastern edge of the outcrop has been indented by incision of streams, so that it forms a very irregular pattern. Much of the formation is concealed by Pierre and Ogallala deposits, but along many of the present stream valleys exposures are numerous, those of the Fort Hays Limestone Member being very good. The character of the Smoky Hill Chalk is such that outcrops are poor and small. Two outliers of the Niobrara, one in Mitchell County and the other in Osborne County, provide conclusive evidence that the Niobrara once was more extensively developed in Kansas. Character--The Niobrara Formation is divided into two members: Smoky Hill Chalk, above, and Fort Hays Limestone, below. 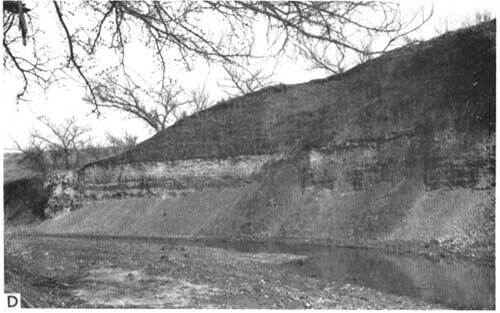 The term Smoky Hill Chalk was first used by Cragin (1896b; see Wilmarth, 1938, p. 2015), and is taken from Smoky Hill River in Kansas. The Smoky Hill is a gray to white, yellow, or orange chalky shale, which contains limonitic concretions, locally massive chalk beds, and many bentonites (Pl. 3B, 3C). The small oyster Ostrea and fragments of the large clam Inoceramus are abundant. The member may be as much as 700 feet thick in Wallace and Logan Counties. The Fort Hays Limestone consists mainly of chalk and chalky limestone that is light gray to gray and massive and ranges in thickness from about 40 to 85 feet (Pl. 5A). Thin beds of light- to dark-gray chalky shale separate the massive chalky limestone layers. 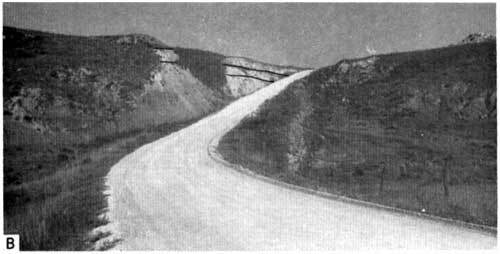 Individual chalk beds may be as much as 7 feet thick; shale partings range in thickness to as much as 9 inches (Runnels and Dubins, 1949, p. 8). The Fort Hays Limestone, like the Smoky Hill Chalk, is very fossiliferous, being especially rich in foraminifers. The term Fort Hays is derived from old Fort Hays, a well-known landmark in western Kansas, and was first used by Williston in 1893. Plate 3B--Niobrara Formation exposed in the vicinity of Cobra Rock, Gove County. Plate 3C--Upper part of the Niobrara Formation (Smoky Hill) in abandoned quarry, Graham County (sec. 7, T. 8 S., R. 24 W.). Plate 5A--Fort Hays Limestone Member of Niobrara Formation exposed on U.S. Highway 283 south of Wakeeney, Trego County. In well samples the two members are especially characteristic and easy to identify. The whitish, very calcareous, soft fossiliferous shale (Smoky Hill) and the white, massive, porous chalky limestone (Fort Hays) are good marker units. The formation also is easily identified on electric logs. Thickness--Thickness of the Niobrara Formation in Kansas ranges from 0 to 750 feet (Fig. 19). Figure 19--Isopachus map of Niobrara Formation in Kansas. Contour interval 50 feet. A larger version of this figure is available. Stratigraphic Relations--The contact of the Smoky Hill Chalk and Fort Hays Limestone is gradational; where the lower part of the Smoky Hill contains numerous chalk beds it is almost impossible to pick a contact. From evidence available at present, the Fort Hays seems to be slightly older than the Timpas Limestone of eastern Colorado. Preliminary correlations of electric logs indicate that the Timpas may be equivalent to a portion of the lower part of the Smoky Hill Chalk, at least in part of Nebraska (Fig. 20). This conclusion is agreed to by E. C. Reed (personal communication, December 9, 1955), but not by V. B. Cole (personal communication, June 2, 1962). Figure 20--Electric-log cross section in southwestern Nebraska and northwestern Kansas showing possible correlation and stratigraphic relations of Cretaceous beds between Graneros Shale and Pierre Shale. Both a larger version and a very large verison of this figure are available. In 1896, Gilbert named the Carlile Shale from exposures in the Arkansas Valley region of eastern Colorado. Hawn (in Meek and Hayden, 1857) and Leconte (1868) gave the first descriptions of the Kansas Carlile (Hattin, 1962); later, more detailed descriptions were published by Hayden (1872), who worked along the Union Pacific Railroad in western Kansas. Distribution--The formation is found throughout large areas of the Western Interior, including about the western one-third of Kansas. The Carlile extends eastward to a line from Republic County on the north to Hamilton County on the south. The best exposed sections are along major drainage systems, which cut diagonally across the belt of outcrop, and in the Blue Hills of Mitchell County and adjacent territory. Exposures of the upper part of the formation are generally good on washed slopes beneath the prominent Fort Hays escarpment, but the lower part usually forms low, rolling, wheat-covered surfaces. Character--The Carlile is part of the unit originally defined as the Fort Benton Group and later recognized as the upper unit of the Benton Shale or Benton Formation, a term still used in parts of Colorado and Wyoming. The earliest proposal to divide the Benton in Kansas was made by Cragin (1896b). The Carlile is now divided into three members (in descending order): Codell Sandstone, Blue Hill Shale, and Fairport Chalk. The Codell Sandstone, uppermost member of the Carlile, was named by Bass in 1926. It is brown to gray, fine to medium grained, subangular, and silty (Pl. 5B). Locally, it is a siltstone. Also, in places the Codell is represented only by a silty or gritty zone (Pl. 5C). The Blue Hill, named by Logan in 1897, is gray to blue-gray, fossiliferous, clayey, noncalcareous shale. It contains several zones of calcareous concretions as much as 8 feet in diameter (Pl. 6A); these concretionary zones are not recognizable in the subsurface. Shale members of the Carlile are easily differentiated, both on electric logs and in well samples, because the Fairport is very calcareous and the Blue Hill only slightly calcareous, if at all. The Fairport, named by Rubey and Bass in 1925, is predominantly a very fossiliferous chalky shale containing stringers of limestone (Pl. 6B). Thin seams of bentonite occur near the base of the member. Plate 5B--Below Fort Hays scarp is Codell Sandstone of Carlile Shale near type locality, Ellis County (NE sec. 3, T. 11 S., R. 17 W.). Plate 5C--Contact of Carlile Shale (below) and Fort Hays Limestone (above) south of Cedar Bluf Dam, Trego County (NW sec. 27, T. 15 S., R. 22 W.). Norte apparent absence of Codell Sandstone. Plate 6A--Upper part of Carlile Shale (Blue Hill Shale) with many concretions, Ellis County (NE sec. 9, T. 11 S., R. 18 W.). Plate 6B--Contact of Greenhorn Limestone (below) and Fairport (above), Russell County (SE sec. 2, T. 15 S., R. 14 W.) Hammer on Fencepost Limestone bed. Hattin (1962) was able to trace numerous key beds in the Carlile for considerable distances. He has suggested a reclassification of the Carlile Shale which would elevate Carlile to subgroup status, Fairport and Blue Hill to formations; and he has proposed the name Saline Valley for the lower member of the Blue Hill and retention of Codell for the upper member. This change, however, has not been adopted by the Kansas Survey. Thickness--Overall thickness of the Carlile is almost uniformly about 250 to 300 feet. The Fairport ranges in thickness from about 80 to 150 feet, and the Blue Hill from about 50 to 160 feet. The Codell ranges from about 2 to 80 feet and normally is about 25 feet thick (McKellar, 1962). Figure 21 shows the thickness of units from top of the Dakota to base of the Fort Hays, and includes the Carlile, Greenhorn, and Graneros Formations. These three units range in thickness from a featheredge on the outcrop to about 450 feet in western Gove County. Stratigraphic Relations--Members of the Carlile Formation are conformable with each other, and the upper and lower boundaries of the formation are conformable with overlying and underlying units. Hattin (1962) was able to demonstrate a hiatus between the Carlile and Niobrara, but found no break between the Carlile and Greenhorn. Figure 21--Isopachus map from base of Fort Hays Limestone to top of Dakota; interval includes Carlile, Greenhorn, and Graneros Formations. Maximum thickness is in western Gove County. Contour interval 25 feet. A larger version of this figure is available. The Greenhorn Limestone is also part of the old Fort Benton Group, a name applied by Meek and Hayden in 1862. Later, Gilbert (1896) divided the Benton into several formations, of which the Greenhorn was one. The unit is named for Greenhorn Station and Greenhorn Creek, 14 miles south of Pueblo, Colorado. Important works dealing with this unit in Kansas include those by Rubey and Bass (1925), Bass (1926), and Bergman (1950). Distribution--The Greenhorn crops out in a narrow band from Washington County on the northeast to Hamilton County on the southwest. Inasmuch as the upper part of the formation is moderately resistant to erosion, it forms a gentle east-facing scarp. The middle and lower parts are less well exposed, except in stream banks and road cuts. Character--Along the outcrop, the Greenhorn Limestone is divided into four members (in descending order): Pfeifer Shale, Jetmore Chalk, Hartland Shale, and Lincoln Limestone, but they have not been recognized generally in the subsurface. The upper two members are commonly grouped together under the name Bridge Creek Limestone. The formation consists mostly of limestone and chalky shale (Pl. 6C). The limestone is gray to light brown, chalky or crystalline, and fossiliferous. The shale is gray to brownish, calcareous, and fossiliferous. In the uppermost part of the formation there is a persistent bed known as the Fencepost Limestone (Pl. 6D). This bed causes an easily identifiable double-pronged "kick" on electric logs, which can be traced from well to well as far as to Wyoming. Because of the easy recognition of this bed, it is often used as a stratigraphic and structural datum. Plate 6C--Greenhorn Limestone along U.S. Highway 36 in east-central Republic County. Plate 6D--Fencepost Limestone fencepost 3.5 miles south of Simpson, Mitchell County. 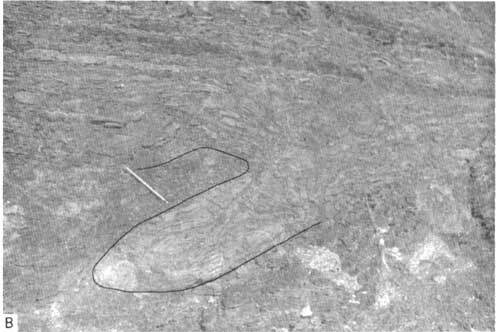 Bergman (1950) was able to recognize in this unit several marker beds that could be traced in the field. Three important ones are the Fencepost Limestone at top of the Greenhorn (Pl. 7A), a "granular calcite bed" or "sugar sand" about 6 feet below the Fencepost, and a unit locally called the "shell-rock limestone," which marks the top of the Jetmore Chalk Member; also, some of the numerous bentonites are traceable over large areas. 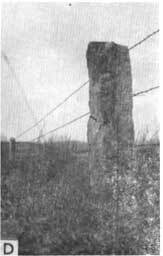 Bergman (1950, p. 15) described the Fencepost as ". . . 0.5 to 1.0 foot thick. It is a massive, chalky limestone, generally tan gray with a characteristic rust-colored streak in the middle part. . . . The bed contains shells of the pelecypod Inoceramus and cephalopods ocasionally are found in it. It forms a minor bench, which is sufficiently well developed on many hillsides that the contact between the Greenhorn Limestone and the overlying Carlile can be located readily. . . ."
Plate 7A--Quarry in Fencepost Limestone 3.5 miles south of Simpson, Mitchell County. Thickness--Thickness of the Greenhorn in Kansas ranges from about 90 to 100 feet. The following are average thicknesses for the individual members: Pfeifer, 20 feet; Jetmore, 22 feet; Hartland, 30 feet; and Lincoln, 28 feet (Moore and others, 1951a). Thickness of the formation is included in the thickness map of the Benton Shale (Fig. 21). Stratigraphic Relations--All members are conformable with each other, as is the formation with overlying and underlying units. Individual beds show remarkable lateral persistence, and they can be traced for considerable distances. The Graneros Shale, the lowermost unit of the old Fort Benton Group, was named by Gilbert (1896). The Graneros is now recognized as the lowest formational unit of the Colorado Group, which includes not only the Benton but also the Niobrara. Because the Graneros is poorly exposed and thin for the most part, it has received little attention. At present, however, stratigraphic studies are being conducted by D. E. Hattin and his associates. Distribution--The extent of the Graneros is only slightly greater than that of the Greenhorn; it covers about two-fifths of Kansas. The formation is also exposed in adjacent states. Character--The Graneros is a medium-gray to black, noncalcareous or slightly calcareous, silty marine shale (Pl. 7B). Locally, it is abundantly fossiliferous, containing both vertebrates and invertebrates. Oysters and shark teeth are common fossils. Many thin streaks of bentonite are found in the shale, and one in particular, the "bentonite marker bed," is traceable over large areas and serves to subdivide the formation. In Kansas this marker bed, a bluish-gray bentonite 1 to 2 feet thick, causes an easily identifiable "kick" on electric logs. Some lenses of sandstone occur in the Graneros Shale. Plate 7B--Slump structure in Graneros Shale exposed on Canyon Road just northwest of Russell, Russelll County. In thin section, it can be seen that the bentonite is composed of montmorillonite showing orientation along wavy laminae that are subparallel to bedding. Locally, the montmorillonite is segregated into coarse wormlike books that amount to about 5 percent of the rock and measure 0.1 to 0.3 millimeter in length. The rock is vertically jointed and shows distinct bedding. . . . In addition to montmorillonite, the thin section contains about 5 percent small angular fragments of quartz and plagioclase. . . . A small percentage of pyrite is present. . . . In the fraction finer than 2 microns, the sample is composed completely of sodium montmorillonite. . . [Fig. 22]. Figure 22--Diffractometer patterns for fractions finer than 2 microns from Atkinson No. 1 Beaumeister well, Cheyenne County. "Bentonite marker bed," 2,001 feet: A, air dried; B, glycerated. Graneros Shale, 2,017 feet: A, air dried; B, glycerated; C, heated to 575°C (adapted from P. C. Franks, in Merriam and others, 1959). Thickness--Thickness of the formation ranges from about 40 to 100 feet. In general it thickens southward, but in northwestern Kansas the Graneros has an almost uniform thickness of about 40 feet. The combined thickness of Graneros, Greenhorn, and Carlile strata is shown in Figure 21. Stratigraphic Relations--The Graneros conformably underlies the Greenhorn Limestone (Plummer and Romary, 1942). Over much of the area where the Graneros rests on the Dakota it is conformable; however, locally there is evidence of a disconformity. Dakota was a name proposed by Meek and Hayden in 1862 for rocks exposed along Missouri River in Dakota County, Nebraska. The use of the name in recent years has resulted in almost complete confusion. Dakota has been employed variously as a formational or group name, expanded or restricted to include more or fewer units than originally defined, miscorrelated, and geographically extended to rock units where correlation has not been possible. Similarly, in Kansas the term Dakota has been used in various ways by different authors. For example, in the late 1800s the Dakota Sandstone was classed as a formation with rank equivalent to the Cheyenne Sandstone and Kiowa Shale. In the 1920s Dakota was defined to include all strata between the Graneros Shale and Permian rocks. Thus the term included not only the Dakota Sandstone of previous usage but also the Cheyenne and Kiowa Formations. The term Dakota Group was recognized in this sense by Moore (1935a) and was so used on the Geologic Map of Kansas prepared by Moore and Landes in 1937. 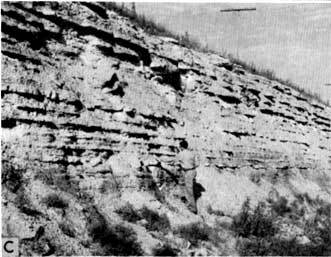 According to Waite (1942), at a conference of Kansas Survey geologists in January 1941, it was decided that the term Dakota Group should include all strata from the base of the Cheyenne Sandstone to the base of the Graneros Shale. 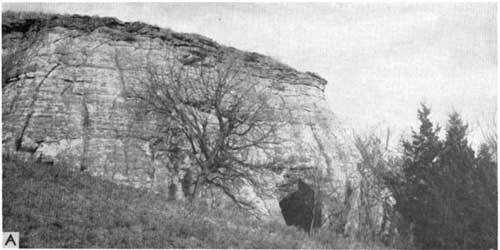 At about this time, Latta (1941) introduced the term Cockrum Sandstone in southwestern Kansas for beds formerly called Dakota. According to the classification proposed by Latta, the Dakota Group included the Cheyenne Sandstone, Kiowa Shale, and Cockrum Sandstone, and this was later accepted by McLaughlin (1942). In February 1942, however, another conference of Kansas Survey geologists led to restriction of Dakota to beds between the Kiowa Shale and Graneros Shale. In Kansas Survey usage since then, Dakota has held the rank of formation on an equal status with Cheyenne Sandstone and Kiowa Shale.
. . . The group as previously defined, transgressed the Upper Cretaceous-Lower Cretaceous boundary line; a multiplicity of names has existed for the various units involved, many of them having been applied to such nonpersistent units as channel sandstone that cannot be correlated with certainty beyond the confines of their type localities; many of the stratigraphic units were never adequately described, Moreover, the Dakota group, as used previously in Kansas, could not be correlated with the Dakota sandstone at the type locality; it was not acceptable to the Committee on Geologic Names of the U.S. Geological Survey; it did not constitute a satisfactory genetic grouping of strata; and the term Dakota group was confused with other usages of Dakota and almost universally implied a sandstone. Although good reasons can be offered for restricting application of the name Dakota to strata between tne Kiowa and Graneros, in my judgment it is preferable to employ the term in a group sense. The Kansas Survey, however, presently uses the word Dakota as a formational designation (see Appendix B). Thickness of the Dakota Group (from the top of the Omadi to the base of the Cretaceous) is shown in Figure 23. Inasmuch as the upper surface is essentially depositional and the lower surface is erosional, the contour lines show pre-Cretaceous topography. Three north-trending areas of thick deposits are shown separated by areas of thinner deposits; the topographic features of this sub-Cretaceous surface are discussed in the section Major Unconformities. Figure 23--Isopachus map of beds between top of Dakota and base of Cretaceous. Inasmuch as the upper surface was essentially flat and horizontal and the lower surface is erosional, countours show position and shape of pre-Cretaaceous topographic features. Contour interval 100 feet. A larger version of this figure is available. For want of a better term, Omadi is used here in place of Dakota for subsurface rocks occurring between the Kiowa Shale, below, and the Graneros Shale, above--hence corresponding to Kansas Survey usage of "Dakota Formation" as applied to outcropping rocks. The formational name Omadi was proposed by Condra and Reed in 1943 as an appropriate substitute for Dakota Sandstone and was intended to include strata of Nebraska occurring between the Fuson Shale and Graneros Shale. The type section is in Omadi Township, Dakota County, Nebraska, along the Missouri River bluffs. The term has not been generally accepted, although C. W. Sternberg and A. J. Crowley recently applied it to beds in the Denver Basin between Graneros and Skull Creek Shales (Boreing, 1953). In Kansas, Omadi, if accepted, would include beds between top of the Kiowa (Skull Creek) Shale and base of the Graneros Shale. Plate 7C--Dakota (Terra Cotta Member) rocks exposed at Buzzard's Roost, Ellsworth Coutny (NE sec. 15, T. 15 S., R. 6 W.). The Dakota [Omadi] formation as defined by Plummer and Romary (1942), and adopted for usage by the Geological Survey of Kansas at that time, included the rocks above the Kiowa shale and below the Graneros shale. The formation was divided into the Terra Cotta member below and the Janssen member above. The Janssen member is more regularly bedded than the Terra Cotta and contains fairly persistent beds of silt, lignite, and clay. The clays and sandstones of the Terra Cotta member for the most part occur in lenses and elongated irregular masses, although the clays and silts in the lower part of the Terra Cotta member occur in fairly regular and persistent beds, especially in Ellsworth, Lincoln, and Ottawa Counties. This fact was not discussed by Plummer and Romary (1942), but was mentioned later by Plummer and others (1954). These beds in the lower part of the Terra Cotta are similar in appearance to those in the Janssen member and probably could be classed as a separate member in the area designated. The upper two-thirds to three-fourths of the Terra Cotta member is an extremely complex unit as observed on the outcrop in Kansas. The most conspicuous rock is the massive gray and red mottled clay, which in some places comprise over a hundred feet of the member. Relatively pure clays, lacking the red mottling from ferric oxide, also occur in long narrow masses, which are paralleled by similar masses of sandstone. Most of the sandstones appear to be channel, beach, or bar deposits, which if viewed in three dimensions would consist of a complex network of elongated bodies. In one horizontal plane the directional trend is northeast-southwest and in an adjacent plane the directional trend is northwest-southeast. The evidence obtained from test holes along the outcrops of the Dakota [Omadi] formation in Kansas is extremely confusing. One test hole may penetrate more than 100 feet of sandstone, but another drilled at the same elevation and a few hundred yards from the first may penetrate only clay. Viewed on a larger horizontal scale, the surface exposures of the Dakota [Omadi] are not susceptible of easy interpretation. The general appearance of supposedly equivalent beds varies greatly from west to east. The clay mineral content of the clay beds also varies. In general the proportion of kaolinite to illite is greater in eastern Ellsworth County, for example, than it is in southwestern Dickinson County. Similar variations have also been found from southwest to northeast. Clays in the Janssen member in Ellsworth and Washington Counties are commonly more refractory than equivalent beds in Ford, Hodgeman, Barton, Lincoln, and Ottawa Counties. Also the ferric iron content is higher in these same clays in Washington County than it is in their equivalents in Ellsworth County. The upper and lower limits of the Dakota [Omadi] formation were primarily defined by Plummer and Romary on the basis of lithology. The shale of the Dakota, including those occurring in the sandstones, are predominantly composed of the clay mineral kaolinite and fire to light colors unless contaminated by ferric oxide. The Graneros and Kiowa shale, on the contrary, are predominantly composed of illite and montmorillonite. Experts on the genesis of clays are agreed that kaolinite is most likely to occur in a nonmarine environment where oxidizing, nonalkaline conditions prevail and where leaching is possible. Illite is more likely to be formed (or preserved) under marine conditions. Therefore, the lithological basis of classification is in reality based on the environments of sedimentation, and the clay minerals of the respective members are diagnostic of marine and nonmarine sediments. Plummer and Romary were of the opinion that the Kiowa and Graneros shale formations are marine in origin and that the Dakota [Omadi] formation is predominantly nonmarine. The Omadi Formation in the subsurface of Kansas can be divided into three members, which are correlated with divisions recognized in the Nebraska portion of the Denver Basin. In descending order, these are: Gurley Sandstone, Huntsman Shale, and Cruise Sandstone. Although the terms Omadi, Cruise, Huntsman, and Gurley have not been widely used by petroleum geologists, this terminology, based on geographic place names, has a sounder basis for permanency than designations by letters of the alphabet, which are used by many geologists. Gurley Sandstone--The Gurley Sandstone is the upper member of the Omadi Formation and uppermost unit of the Dakota Group as used here. Distribution of the Gurley in Kansas is slightly smaller in area than that of the Cruise and Huntsman Members. Generally speaking, the member becomes more shaly both to the east and south. In extreme northwestern Kansas, the Gurley comprises two sandstones separated by a thin shale unit, but in other places the member consists of a series of alternating thin sandstones and shales. The sandstone is composed of light-gray, fine- to medium-grained, subrounded quartz fragments and minor amounts of mica, glauconite, and pyrite. The sand locally is carbonaceous; it may contain streaks of dark-gray to black shale, and in some places the sand is coarse grained and even conglomeratic. Thickness of the Gurley Sandstone ranges from a featheredge to about 120 feet. In general the member thins eastward and southward, but throughout a large area in Kansas it is surprisingly uniform in thickness. Near the eastern limit of the Omadi in Kansas the Graneros Shale seemingly oversteps the truncated Gurley; consequently, in all probability the member does not crop out in Kansas. A few marine fossils have been reported from the Gurley, hence it is at least partly marine. The Gurley corresponds to the "D" and "G" sands as recognized in the Denver Basin. Both the Gurley and Huntsman are Gulfian in age (Cobban and Reeside, 1952). Huntsman Shale--The Huntsman Shale, the middle member of the Omadi Formation, overlies the Cruise Sandstone and in turn is overlain by the Gurley Sandstone. Areal distribution of the Huntsman in Kansas is probably about equal to or slightly less than that of the Cruise Sandstone. The Huntsman is predominantly greenish-gray to gray, noncalcareous, micaceous, clayey or silty shale containing some interbedded light-gray micaceous siltstone. Siderite pellets are common and in many places abundant, especially in the clay. Thickness of the member ranges from 20 feet to about 90 feet. No marine fossils have been reported from the Huntsman. The Huntsman is tentatively correlated with the Janssen Clay Member of the Dakota Formation, as described by Plummer and Romary (1942). Cruise Sandstone--The Cruise Sandstone is the lowest member of the Omadi Formation. It overlies the Kiowa Formation (Lower Cretaceous) or Permian beds where the Comanchean is absent. The Cruise probably has the largest areal distribution of any Cretaceous deposit in Kansas. The Cruise is mainly a light-gray, gray, or light-brown sandstone consisting of fine- to medium-grained, subrounded, friable quartz fragments and minor amounts of mica, glauconite, and carbonaceous material. Eastward, the member becomes more and more shaly and clayey; the sandstones become finer grained and grade into siltstones (Pl. 8A). The amount of sand also decreases eastward to such an extent that on the outcrop about three-fourths of the member is clay or shale (Pl. 8B). The shale is medium gray, noncalcareous, soft, and in part clayey. Siderite pellets are present locally. 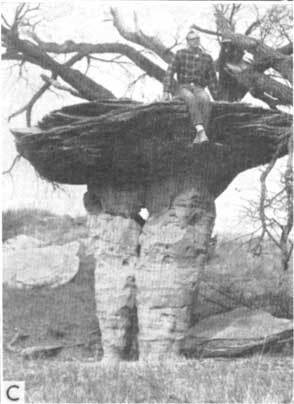 Large concretions composed mostly of quartz grains cemented by calcite are common locally, for example, at Rock City in Ottawa County (Mack, 1962) and at Pulpit Rock in Ellsworth County (Pl. 8C, 8D). Sandstones on the outcrop show evidence of having been deposited as channel fills (Pl. 9A, 9B, 9C). Thickness of the member ranges from 100 to 200 feet. Plate 8--Dakota Sandstone. A, Palmer's cave, Ellsworth County (sec. 29, T. 14 S., R. 6 W.). B, Good exposure of upper part of Dakota, approximately 4 miles north of Russell on U.S. Highway 281, Russell County. C, Pulpit Rock just south of Carniero, Ellsworth County (sec. 19, T. 15 S., R. 6 W.). D, Rock City concretions southwest of Minneapolis, Ottawa County (sec. 14, T. 11 S., R. 4 W.). Plate 9--Dakota Sandstone. A and B, Pawnee Rock, Barton County (NE sec. 33, T. 20 S., R. 15 W.). C, Exposure in abandoned clay pit on southwest side of Cheyenne Bottoms, Barton County (sec. 9, T. 19 S., R. 13 W.). Fossils indicate that the member is at least in part marine. The Cruise Sandstone seems to correlate in stratigraphic position with the Terra Cotta Member of the Dakota Formation (described by Plummer and Romary, 1942) at outcrops in north-central Kansas. [Note: Norman Plummer (personal communication) believes from preliminary studies of the clay materials in the Cruise Sandstoue that possibly they are not equivalent to the Terra Cotta Member. His work indicates that the clays of the Cruise are marine, whereas clays of the Terra Cotta are nonmarine.] Some or all of these beds may be equivalent to the Cockrum Sandstone of southwestern Kansas. Some geologists use the term "J" sandstone for beds that are here called Cruise. In this report the Cruise is tentatively placed entirely in the Gulfian Series, although the exact position of the boundary between the Lower and Upper Cretaceous is not known. Cobban and Reeside (1952) assigned the Omadi (Dakota Formation) to the Upper Cretaceous. The Kiowa Shale, the uppermost formation of the Comanchean Series, was named by Cragin in 1894 from rock exposures in Kiowa County, south-central Kansas. Cragin later redefined the Kiowa to exclude the "Champion shell bed" and still later changed its boundary to include the shell bed as the lowermost part of the formation. This usage of the term has been followed subsequently. Distribution--The best exposed outcrops of the Kiowa are in south-central Kansas in the vicinity of Cheyenne Sandstone outcrops. The formation is distributed over a slightly larger area than that of the Cheyenne Sandstone. Character--The formation is predominantly a medium- to dark-gray, micaceous, silty, carbonaceous, soft to hard marine shale, but it includes minor amounts of limestone, sandstone, and bentonite (Pl. 10A). The limestone, which occurs as thin "stringers" in the shale, is composed principally of shell fragments. At outcrops, beds of light-gray limestone, containing gypsum or pyrite, are commonly less than 18 inches thick (Latta, 1948, p. 87). The "Champion shell bed" (Latta, 1946) occurs at the base of the formation, but seemingly this bed can not be recognized from well samples. Lenticular light-gray sandstone is composed of fine- to medium-grained quartz fragments. Latta (1948) described several of the sandstone lenses that occur at different stratigraphic horizons in the formation. Bentonite, which occurs as thin seams in the shale, is white or bluish gray. Plate 10A--Exposures of Kiowa Shale underlain by Cheyenne Sandstone in Champion Draw near Belvidere, Kiowa County. Thickness--Maximum thickness of the Kiowa is about 380 feet; its average thickness is probably about 100 feet. Some of the apparent variation in thickness of the formation results from uncertainty in determining the upper boundary of the unit. Stratigraphic Relations--In some areas, sandstone in the lower part of the Omadi Formation seems to interfinger with shale in the upper part of the Kiowa Shale; consequendy, the limit between the two units is arbitrary. Locally, however, an unconformity separates the two formations (Latta, 1948, p. 86). In areas where the Cheyenne is missing, the Kiowa lies directly on Permian rocks. 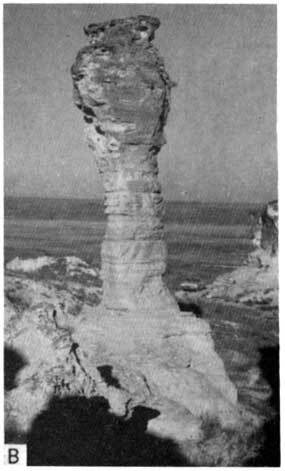 The Cheyenne Sandstone, lowest unit of the Cretaceous System in Kansas, was named by Cragin in 1889 from exposures of sandstone at Cheyenne Rock in south-central Kansas. The formation includes beds between the Kiowa Shale, above, and strata then called Triassic but now known to be Permian. Later, Cragin divided the formation into several members, but the proposed names were later discarded by the Federal Geological Survey as applicable only to facies of the Cheyenne. Distribution--Areal distribution of Comanchean rocks is more restricted than that of Gulfian rocks. The Comanchean is best exposed in the Belvidere region and adjoining areas in Barber, Kiowa, Comanche, and Clark Counties, in south-central Kansas. Character--The Cheyenne is mainly a light-colored, fine- to medium-grained, friable, cross-bedded sandstone containing lenses of sandy shale and conglomerate and minor amounts of clay, selenite, ferruginous nodules, and pyrite. Sandstone is the dominant rock type (Pl. 10B, 10C). Subsurface samples of the formation consist almost entirely of white, fine to medium, subrounded, frosted, loose or slightly cemented quartz grains. In most samples the cement is pyrite or calcium carbonate. At the Champion Draw section (sec. 9, T. 30 S., R. 16 W.) in Kiowa County, pebbles and cobbles of quartzite, quartz, and chert are present at the base of the Cheyenne Sandstone. According to Latta (1946, p. 237), the thickness of this conglomerate ranges to 45 feet. Plate 10B--Cheyenne Sandstone erosional remnant near Belvidere, Kiowa County. Plate 10C--Cheyenne Sandstone outcrop near Belvidere, Kiowa County. Thickness--Total thickness of Cheyenne Sandstone along the outcrop ranges from 33 to 94 feet. In the subsurface the formation reaches a maximum thickness of about 300 feet; it is in excess of 200 feet in north-central Ellis County (Frye and Brazil, 1943). Abrupt changes in thickness in short distances result from the fact that the formation was deposited on an unevenly eroded pre-Cretaceous surface of considerable local relief (Pl. 11A). In general the formation thins to the east and south. Plate 11A--Cheyenne Sandstone (Lower Cretaceous) overlying "Taloga Formation" (Permian), Clark County (E2 sec. 25, T. 32 S., R. 25 W.). Stratigraphic Relations--The contact with the overlying Kiowa Shale is conformable, but the lower contact is erosional. First Cretaceous deposition on the irregularly eroded Permian-Triassic-Jurassic surface was a conglomerate of pebbles and cobbles, just above the unconformity, which is variously assigned to the Cheyenne, Kiowa, or Omadi, whichever is the lowest Cretaceous unit present. Pebbles consist of igneous and metamorphic rocks and chert; quartzite and chert predominate (Pl. 11B, 11C). On the basis of fossils in the chert, the conglomerate is presumed to have had an eastern source (Moore and others, 1951a, p. 28). Plate 11B--Basal Cretaceous conglomerate, Rice County (SW sec. 32, T. 19 S., R. 6 W.). Plate 11C--Pebbles and cobbles of basal Cretaceous conglomerate consisting of igneous and metamorphic rocks and chert, Rice County (SW sec. 32, T. 19 S., R. 6 W.). The Cheyenne Sandstone was deposited on the eroded pre-Cretaceous surface. It is natural to assume that the first deposition took place in topographically low areas and that, as sedimentation continued, valleys were filled and sedimentation eventually extended over the divides. One of these large filled valleys is shown in Figure 12. As the Cretaceous sea advanced from the south, the strand line probably oscillated. Gradually a completely marine environment came to characterize Kansas in Kiowa time. To the east, land was still high enough to prevent accumulation of early Cretaceous deposits. As the sea swept farther north and east, sediments came to have an overlapping relation on the pre-Cretaceous surface, each younger deposit extending farther to the north and east (Pl. 11D). Plate 11D--Kiowa Shale (Lower Cretaceous) overlying Ninnescah Shale (Permian), Ellsworth County (sec. 2, T. 17 S., R. 6 W.). By the beginning of Omadi deposition, the sea floor had become relatively smooth, even though minor irregularities of the pre-Cretaceous surface persisted (Plummer and Romary, 1942, p. 325). Locally, as the shoreline separating marine and nonmarine conditions shifted, the upper part of the Kiowa Shale and the lower part of the Omadi Formation interfingered. In some areas conditions must have fluctuated from marine to near-marine to nonmarine many times during deposition of the Omadi. The end of Omadi time was marked by a readvance of the Cretaceous sea over the Kansas region. It is especially evident along marginal areas that marine planation truncated part of the Omadi sediments. The Graneros Shale was deposited when marine conditions returned. Volcanic eruptions added layers of ash, now altered to bentonite. As the basin subsided, Greenhorn limestone and limy shale were laid down. Volcanoes were still active and contributed ash to the sediments. Conditions again changed before deposition of the Fairport Chalk. 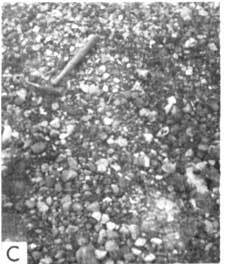 Hattin (1952, p. 20) believed that this shale was deposited during a period of areally restricted sedimentation and that the silt present in this member was transported by wind. The Blue Hill Shale was deposited in shallower water and probably far from high land, as shown by the absence of coarse clastic particles of the kind so common in the Fairport Member. Volcanoes were still active during deposition of the Carlile Shale and supplied quantities of material to the sediments. 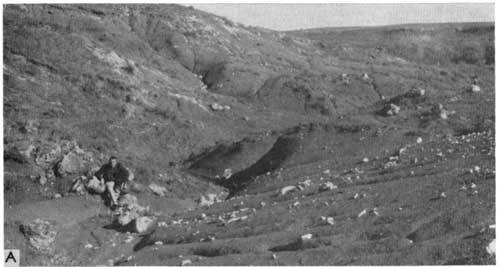 Rapid deposition of the Codell Sandstone indicates a temporary regression of the sea (Hattin, 1952). The Fort Hays Limestone indicates a clearwater marine environment. A moderate change of conditions, seemingly marked by increased turbidity of the shallow sea, resulted in deposition of the Smoky Hill Chalk. Volcanic activity must have been at a maximum at this time in order to produce the many bentonite beds in the Niobrara. Following Niobrara time evidence of many ash falls was recorded in the Pierre. Some time after Pierre Shale deposition in Kansas, the area was tilted toward the Denver Basin, and Cretaceous beds east of Colorado were elevated, eroded, and beveled. It is impossible to ascertain the eastern limit of Cretaceous deposition because all evidence of eastern marginal areas of the Cretaceous seaway has been removed by erosion. In post-Pierre time the amount of Cretaceous and older rock material removed by erosion from Kansas must have been great. Considerable time elapsed from the end of Pierre sedimentation until deposition of the Ogallala Formation. The relative age of Cretaceous beds is shown in Figure 24, which is adapted from Cobban and Reeside (1952). Some of the nomenclature used in various parts of Kansas prior to publication of the chart is also shown. Cretaceous stratigraphic names used in Kansas and their present status are given in Appendix B. 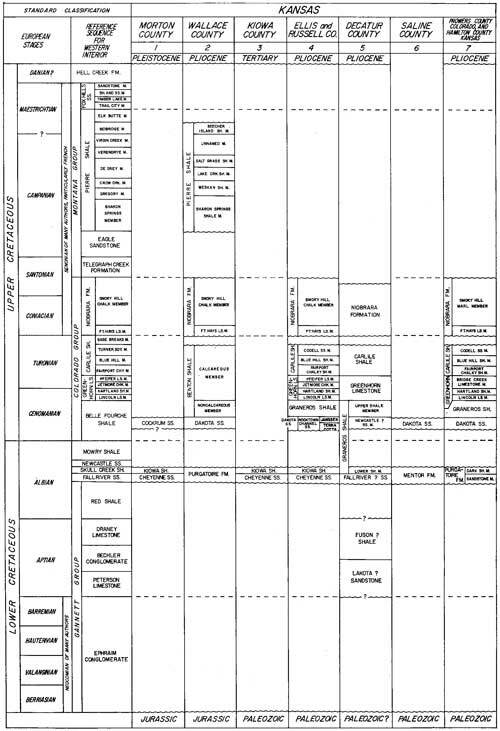 Figure 24--Chart showing terminology used for Cretaceous units in Kansas (adapted from Cobban and Reeside, 1952). 1, McLaughlin (1942); 2, Elias (1931); 3, Twenhofel (1924); 4, Bass (1926), Plummer and Romary (1942), Rubey and Bass (1925); 5, Condra, Schramm, and Lugn (1931); 6, Twenhofel (1924); 7, Bass, (1926), Dane, Pierce, and Reeside (1937), Patton (1924). Correction: the Fairport Member of the Carlile Shale is now referred to as Fairport Chalk. This figure is available as a PDF file. After deposition of the Morrison Formation (Late Jurassic), considerable time elapsed before the first Cretaceous sediments were deposited in Kansas. During this interval, unknown quantities of pre-Cretaceous rock were weathered, eroded, and transported from Kansas and redeposited elsewhere. The configuration of the erosional surface beneath the Cretaceous, perhaps partly much older than Jurassic in origin, is shown in Figure 25. Figure 25--Map of Kansas showing present configuration of surface at base of Cretaceous beds, i.e., topographic features that were developed on pre-Cretaceous surface. Three major northward-trending valleys and their tributaries are shaded. Contour interval 100 feet. Additional detailed work was done on this surface by Schuman (1963); Jesse McNellis (personal communication, August 13, 1963) believes the valley as shown in Rush County is due to a miscorrelation of placing the Cretaceous-Permian contact. A larger version of this figure is available. Because it is almost impossible to identify the erosional surface from data given by electric and radioactivity logs, information for the map was obtained chiefly from sample logs of the Kansas Survey and the Kansas Sample Log Service. Some data were gathered from logs of ground-water test holes drilled by the Ground-Water Division of the State and Federal Geological Surveys, especially along the eastern margin of the Cretaceous outcrop where the Cretaceous is thin. Configuration of the contours reveals a northward-sloping surface having sizeable relief. Although the map shows the surface as it is now (datum, sea level), it is believed that deformation during and after Cretaceous time changed it only slightly. The surface is cut into beds of Permian, Triassic, and Jurassic age. Three major north-trending valleys and numerous minor tributaries are cut on the surface. One of these valleys extends from eastern Rawlins County through eastern Thomas County, western Gove County, and Lane County to eastern Finney County. Another extends from western Phillips County through western Rooks County and Trego and Ellis Counties to Rush County. The easternmost valley is located in Jewell and Mitchell Counties and western Lincoln and Ellsworth Counties. From the angle at which the tributaries meet the main trunks, it appears that the streams were incised on a north-sloping surface. Divides separating the valleys show that at least 400 feet of topographic relief was developed on the erosional surface. Until they were filled, these large valleys must have exerted considerable influence on deposition of lower Cretaceous sediments. It has long been recognized that Jurassic rocks in the subsurface underlie about the western one-fifth of Kansas (Fig. 26); yet, little work was done to describe these sediments until the early 1950s, partly because of lack of available well data and partly because the Jurassic beds as yet have no economic significance. All Jurassic deposits in Kansas, ranging in thickness from a featheredge to 350 feet, are assigned to the Morrison Formation. Figure 26--Map of Kansas showing subsurface distribution of Jurassic rocks. Previous brief descriptions of the Jurassic in Kansas have been published by Elias (1937b), Landes and Keroher (1939), Norton (1939), Ver Wiebe (1939), Latta (1941), McLaughlin (1942, 1943, 1946), Landes and Keroher (1942), Moore and others (1951a), Prescott (1951), and Lee and Merriam (1954a). Moore and others (1951a) and McCoy (1953) presented generalized maps to show the areal extent of the Jurassic in Kansas. Lee and Merriam (1954a) presented a more detailed map of the distribution of these sediments, along with a brief description of their lithology. Merriam (1955a) published a detailed description of Jurassic rocks in Kansas. In 1956 McKee and others, in an excellent, comprehensive publication on the system, described Jurassic deposits of the United States. Jurassic rocks occur only in the subsurface in the western part of the state, west of a line extending from Phillips County to Morton County. 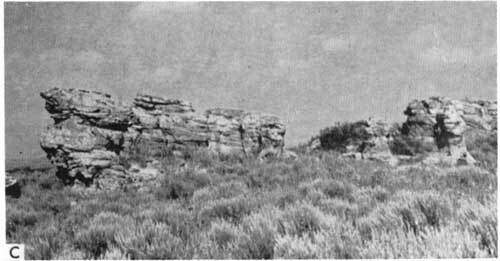 The outcropping Jurassic rocks nearest to Kansas occur in Cimarron County, Oklahoma (Stovall, 1943), Union County, New Mexico (Harley, 1940), and at Two Buttes, Prowers and Baca Counties, Colorado (Sanders, 1934). Portions of these Jurassic rocks have been correlated with the type Morrison Formation, located near the town of Morrison, Colorado (Waldschmidt and LeRoy, 1944). 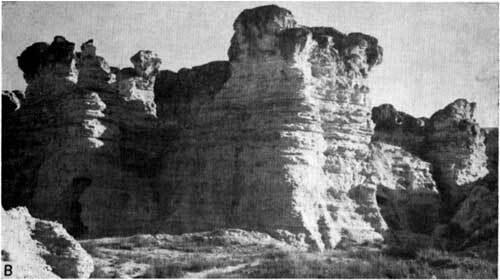 The Morrison of the subsurface of western Nebraska has been described by Condra and Reed (1943). The strata lying between the Permian and Triassic? and the Cretaceous in Kansas are tentatively correlated with the Morrison Formation because of their similarity to Jurassic beds assigned to the Morrison in neighboring states. The Morrison Formation, which was named by G. H. Eldridge in 1896 (in Emmons, Cross, and Eldridge, 1896), consists of shale, sandstone, and limestone, and small amounts of chert and anhydrite. Shale is the predominate lithologic type (Merriam, 1955a). Two distinct lithologic units of the Morrison Formation are recognizable in Kansas. Both units consist of sandy shale, but the upper one contains limestone "stringers" and the lower is cherty and contains anhydrite. All the shale seems to be similar lithologically; the units are recognized by the associated limestone, chert, and anhydrite. A tripartite division of the formation might be possible if better well samples were available. In surface sections the chert forms a single thin bed or several thin layers within a thickness of 10 to 20 feet of shale (S. S. Oriel, personal communication). Thus, it might be possible to distinguish an upper unit of sandy shale and limestone, a middle unit of shale interbedded with chert, and a lower unit of shale containing anhydrite. Although this tripartite division is only vaguely recognizable in the well logs, the units are fairly consistent in relation to one another over the entire area. Because the top of the chert is probably the most consistent and best defined datum, it has been used for structural mapping. Ogden (1954) described this same chert, which also occurs in Colorado, Utah, Wyoming, and New Mexico, and suggested that it may be an altered volcanic ash. If true, it represents a very valuable time-surface marker. An alternate suggestion has been made by Frederickson, DeLay, and Saylor (1956); they conclude that the chert was formed as concretionary deposits of chalcedony concentrated by ground water. The chert is absent in Phillips County, eastern Norton, Graham, and Gove Counties, and Trego County. The anhydrite does not extend east as far as the chert and is absent in Norton County, northeastern Decatur County, most of Graham, Gove, and Thomas Counties, southern Wichita and Greeley Counties, and Kearny and Hamilton Counties (Fig. 27). In parts of Gove and Thomas Counties where anhydrite is absent, the Morrison thins in an area over the approximate location of the Oakley Anticline. Figure 27--Isopachous map of Morrison Formation (Jurassic) in western Kansas (adapted from Merriam, 1955a). Contour interval 50 feet. A larger version of this figure is available. The upper unit is the more extensive of the two and is present over the entire area of occurrence. The absence of limestone in some wells is probably due to local conditions during deposition. Where only sandy shale is present (no chert or anhydrite), it is assumed that the sediments represent the upper unit. Because it is possible to recognize the units and their areal extent, one is able to show that younger divisions of the Morrison Formation overstep older ones on the Permian-Triassic surface. The Morrison units are also recognized and correlated by LeRoy (1946), Ogden (1954), and S. S. Oriel (personal communication) over an area of several states. Character--The lithologic descriptions herein presented apply to the formation as a whole and not to any particular unit. The lithology is about the same for a given rock type, regardless of its stratigraphic position in the section. Characteristically the shale is predominantly greenish gray but locally is tinted buff, brown, red, or purple; many beds are silty or sandy, calcareous, and soft. Disseminated at random throughout the shale are very fine to fine, subrounded to rounded sand grains and clear or white quartz fragments. In general the amount of calcium carbonate in the shale increases westward and northwestward. Small flakes of mica and grains of pyrite are also present, as well as very small round pellets resembling the siderite pellets found in the Dakota rocks. Except in part of Phillips County, where it constitutes a considerable part of the section, sandstone is sparse in the formation. It is composed of white, fine-grained, subrounded, frosted, loosely cemented quartz fragments chiefly in the basal part of the formation. Other thin beds of sandstone of similar lithology are scattered throughout the formation, but they are more abundant in the eastern part of the area. White to gray-green siltstone is a minor constituent. The limestone "stringers" are white to light gray, gradational from chalky to shaly or crystalline, variously soft to hard, and in places contain small cubes of pyrite. The limestone seemingly occurs as thin beds in the shale and may be found stratigraphically anywhere in the formation, but it commonly lies above the chert. Insoluble residues of the limestone consist of very finely disseminated matted siliceous material. The chert is white to pink, although some has a bluish tinge; it is generally translucent and is conchoidally fractured. Some of the chert is chalcedonic. The anhydrite is white to pinkish and crystalline or sugary. Distribution and Thickness--Distribution of the Morrison Formation is shown by an isopachous map (Fig. 27). The thickness of the formation ranges from a featheredge along the southeastern side of the area to 300 feet in Cheyenne County. Thus, the Morrison increases in thickness to the northwest, forming a wedge-shaped mass between the Permian-Triassic? and the Cretaceous sediments. Several northwest-elongated areas of thinning of the Morrison are shown, especially in eastern Phillips County, northeastern Graham County, northwestern Gove County, central Wichita County, and southeastern Greeley County. In northwestern Gove County the Morrison has been completely removed, and Cretaceous beds lie directly on Permian. Areas of thicker deposits flank both sides of areas in which the Morrison is thin or absent. Although the zero line of the formation is irregular, its overall trend is persistently toward the northeast. There are two areas of semi-isolated Morrison, one in northwestern Morton County and the other in southeastern Phillips County. In Morton County a ground-water test penetrated 28 feet of blue-green clay and marl and 12 feet of blue-green, light-gray, and brown sandstone, which McLaughlin (1942, p. 72) regarded as Morrison. These rocks lie between the Cheyenne Sandstone of Cretaceous age and Triassic? redbeds. The rocks thus described closely resemble the Morrison, and they are classed as such. Morrison was reported from four wells in southeastern Phillips County, but samples were available from only one well. 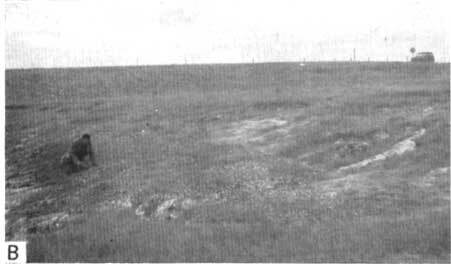 Examination revealed Morrison-like beds, but not typical Morrison, such as occurs farther west in Kansas. On the other hand, the samples do not resemble Dakota, Kiowa, or Cheyenne, and are certainly not redbeds. Although most of the samples consist of sandstone, some light-green sandy micaceous noncalcareous shale is present, and it is judged that these beds all belong to the Morrison. Some support for this conclusion is found in the evidence that the Jurassic extends farther east in Nebraska than in Kansas (E. C. Reed, 1950). The deposits in Nebraska are also sandier in the east than in the west. Stratigraphic Relations--The Morrison Formation in Kansas unconformably overlies Permian or Triassic? beds and is unconformably overlain by Cretaceous formations--Dakota, Kiowa, or Cheyenne. The Morrison overlies the Permian, except in part of Morton County in the extreme southwestern part of the state, where it overlies beds of Triassic? age. A study of the distribution of the divisions of the Morrison Formation reveals an interesting relationship. The eastern limit of these units is shown on Figure 27. Each successively younger rock type extends farther to the east, forming an overstep relationship on the Permian-Triassic surface. The anhydrite is missing in parts of Gove and Thomas Counties that correspond in position to the Oakley Anticline (Lee and Merriam, 1954a, pl. 3A). The eastern limit of the anhydrite also borders the western edge of the Cambridge Arch, and it is concluded that these structurally positive areas were high during deposition of the lower Morrison. Because the chert extends across both of these areas, it is assumed that the low areas were filled by deposition of anhydrite and shale, allowing the chert to overlap eastward. The upper unit extends still farther eastward. The top of the persistent chert is assumed to represent a stratigraphic datum that was originally approximately flat and horizontal; Figure 28 shows the approximate relief on the lower and upper surfaces of the Morrison Formation. Although the period of erosion extended from the Permian to Late Jurassic, and although the pre-Morrison beds were extensively beveled, the topographic relief of the erosional surface was about 110 feet. Figure 28--Cross section of Morrison Formation (Jurassic) showing topographic relief on lower and upper surfaces (from Merriam, 1955a). A larger version of this figure is available, as is a version formatted as one cross section. Environment of Deposition--The Morrison Formation in Kansas probably is nonmarine, although this can not be proved by available information. At the nearest outcrops, the sediments of the Morrison are fluvial in origin (Stovall, 1943, p. 67), and the deposits in Kansas resemble them in lithologic nature and in geologic setting; hence, it is believed that they also are nonmarine. In Figure 29, which is a clastic-percentage map of the Morrison Formation, the 100-percent line indicates all-clastic material, the 90-percent line indicates 90 percent clastics and 10 percent nonclastics, etc. The percentage of nonclastic material in the total section ranges from 0 to 36 percent. The clastic sediments are mainly sandstone and shale, whereas the nonclastics are limestone and anhydrite. Figure 29--Clastic-percentage map of Morrison Formation (Jurassic) in western Kansas. Distribution of clastics suggests that beds were deposited by northwestward-flowing streams and that source of sediments was southeast (from Merriam, 1955a). A larger version of this figure is available, as is an Acrobat PDF version (300 kB). A belt of clastic sediments 6 to 40 miles wide is located along the southeastern side of the area from Phillips County to Morton County. The formation is similarly clastic in an area in Thomas County and southeastern Rawlins County. Except in part of eastern Phillips County, where the section is composed mostly of sandstone, the clastic materials consist mostly of sandy shale. Because coarser clastics, normally expected along a depositional pinchout, are absent, it is believed that the present margin of the upper unit of the Morrison Formation represents an erosional boundary. In general, the map shows that the nonclastic material in the formation increases from southeast to west and northwest, except in two northwest-trending areas: (1) southwestern Sherman County and Wallace and Wichita Counties, and (2) northeastern Sheridan County and eastern Decatur County. Between these areas of nonclastic material there are places in Gove and Thomas Counties and southeastern Rawlins County where the clastic content of the Morrison exceeds 90 percent. This area corresponds roughly to the position of the Oakley Anticline. As already pointed out, this structural feature, which was topographically high, controlled deposition of the sediments that compose the lower unit. Distribution and position of the clastic materials of the Morrison indicate that the source of sediments was to the southeast. Hence, the direction of stream flow must have been northwesterly. Because the streams flowed on a surface of low relief, they must have been sluggish and capable of carrying only fine-grained sediments. Small lakes and back-water areas also must have developed on low, flat, marginal areas. Anhydrite accumulated under desiccating conditions, which alternated with humid conditions that favored fluvial deposition. Deposition of the lower unit ended with an ash fall. The clastic sediments in Gove and Thomas Counties seemingly are delta deposits. Behind this delta, if it existed, would be quiet water favorable for deposition of fresh-water limestone. Limestone would also be deposited farther northwest in areas where clastic sediments were not deposited. Age and Correlation--It is probably only by chance that no fossils have been found in the well samples of the Morrison Formation; many fossils have been found at surface exposures. Stovall (1943, p. 68) has described dinosaur remains, some chara, ostracodes, gastropods, and pelecypods from Cimarron County, Oklahoma. The chert bed is the best marker in the section and can be traced throughout most of the area where Jurassic rocks are present. This chert bed is undoubtedly the one described by Ogden (1954). The unit can be traced into Wyoming, where it occurs in the marine upper Sundance (S. S. Oriel, personal communication). The lower unit of the Morrison Formation in Kansas, then, is believed to be equivalent to the upper Sundance of Wyoming and possibly to the Ralston Formation of Colorado (LeRoy, 1946). McKee and others (1956) have shown this unit to be equivalent to the Wanakah Formation of Colorado and New Mexico, Summerville Formation of Arizona, and Swift Formation of North Dakota and Montana. 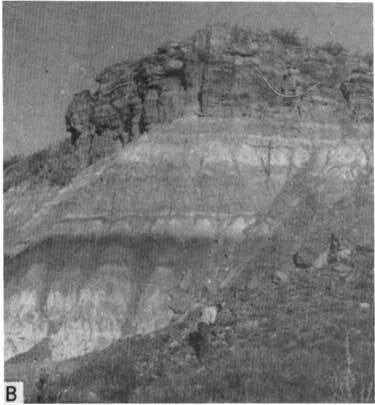 The upper unit of the Morrison Formation in Kansas is equivalent to the type Morrison, as described by Waldschmidt and LeRoy (1944). The age of the Morrison in Kansas is Late Jurassic (Imlay, 1952). In Kansas Triassic deposits are known to occur only in the extreme southwestern part. Little interest has been shown in them, mainly because at present they have no economic value except for local ground-water supplies. They are assigned to the Dockum? Group. The Dockum Group was named by W. F. Cummins in 1890 (p. 189) from exposures near Dockum, Dickens County, Texas. In Texas the group is divided into the Trujillo Formation (above) and Tecovas Shale (below). 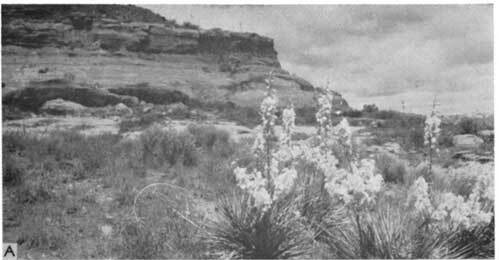 The Dockum unconformably overlies Permian rocks and is unconformably overlain by the Blanco Formation of Pliocene age (Wilmarth, 1938, p. 616). 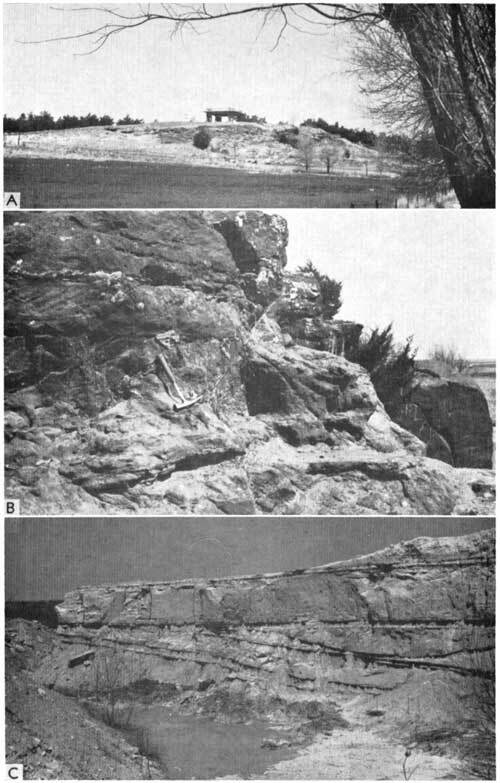 Rocks in Kansas between the top of the "Taloga Formation" (Permian) and base of the Morrison Formation (Jurassic) have been assigned by Moore and others (1951a, p. 29) to the Dockum? Group, but no attempt has been made to subdivide them. These rocks, which consist of redbeds regarded as continental in origin, have been traced from Oklahoma and Texas into Kansas. Distribution--Distribution of the Dockum? Group in Kansas is shown in Figure 30. It is present only in the extreme southwest, mainly in Morton and Stanton Counties but also in part of Hamilton County. It is found both on the surface and in the subsurface. Figure 30--Map of Kansas showing surface and subsurface distribution of Triassic rocks. Character and Thickness--The Triassic redbeds crop out at two localities in Morton County (sec. 5 and 7, T. 34 S., R. 42 W.; sec. 12, T. 34 S., R. 43 W.) along the north bank of Cimarron River (McLaughlin, 1942). At Point of Rocks, a section of almost 40 feet of Triassic is exposed, composed almost entirely of sandstone (Pl. 12A). The base is not exposed and the section is capped by Ogallala "mortar beds." The sandstone is red, brown, yellow, maroon, tan, and green, fine to medium grained, and soft. Some of it is limonitic and some is cross bedded (Pl. 12B). One bed is conglomeratic. About one-eighth mile upstream is another section similar to the Point of Rocks outcrop but containing several shale "breaks" as much as 3 feet thick. The shale is dark red, silty, and platy (Merriam, 1963). Plate 12A--Redbeds of ther Dockum? 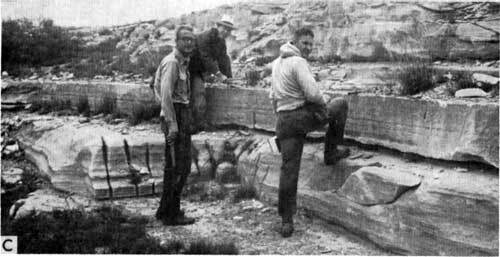 Group, Triassic, at Point of Rocks, Morton County (sec. 12, T. 34 S., R. 34 W.). Plate 12B--Cross-bedded sandstone of Dockum? Group at Point of Rocks. Numerous ground-water test wells have penetrated rocks that have been tentatively assigned to the Triassic. McLaughlin (1942, p. 71) has identified 320 feet of redbeds in Hamilton County as Triassic. He stated that the contact between Triassic and Permian redbeds is indefinite because rocks of the two systems are very similar. Although the Permian-Triassic boundary is difficult to determine, especially in the subsurface, Oriel and Mudge (see McKee and others, 1959, p. 3) have listed five important general differences, as follows: (1) bedded evaporites are absent in the Dockum Group; (2) mudstones in the Dockum are brightly variegated, whereas those in the "Taloga Formation" are dark red to dark red brown; (3) grain size in the Dockum is fine to coarse, but rarely exceeds fine in the "Taloga"; (4) mica flakes in the Triassic are larger than those in the "Taloga"; and (5) in Colorado, locally, fragments of chert are abundant in the lowermost Dockum but are rare in the upper part of the Permian. Stratigraphic Relations--The Dockum? Group unconformably overlies the "Taloga Formation." The interval of time represented by this hiatus is believed to be considerable. The surface on which the Triassic was deposited was probably beveled and had low topographic relief. No conglomerate has been reported at the Permian-Triassic boundary. Erosion of the Permian-Triassic surface had developed a certain degree of relief by the time of deposition of the Morrison Formation. It is not known whether the present limits of the Dockum? are depositional or erosional, but part of the deposit probably was eroded prior to deposition of the Morrison Formation. Environment of Deposition--In a remarkably fine summary of the Triassic of the United States, McKee and others (1959) have shown that the Dockum? beds of southwestern Kansas, as well as equivalent deposits in southeastern Colorado and northwestern Oklahoma, were deposited in the northern end of a large basin which centered in western Texas and eastern New Mexico. Age and Correlation--Moore, Frye, and Jewett in 1944 (p. 154) and Moore and others (195Ia, p. 29) tentatively placed the outcropping redbeds in the Dockum? Group, which is assigned to the Upper Triassic. Oriel and Craig (1960) put the Dockum Group of southeastern and south-central Colorado in the Upper Triassic, as did McKee and others (1959). Oriel and Craig have shown the Kansas Dockum? to be equivalent, or partly so, to the Jelm Formation of north-central Colorado and the Chinle Formation of western Colorado.